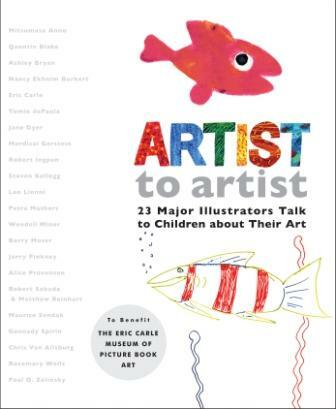 Artist to Artist is an amazing collection of 23 successful children’s book illustrators/authors giving encouragement and advice to children. Authors like Eric Carle, Tomi dePaola, Leo Lionni, Maurice Sendak, and Chris Van Allsburg share words of wisdom in a letter format. Also included are photos of the professional artists as children and an artistic self-portrait as well as a fold-out page containing multiple colorful examples of each artist’s work. A wonderfully intimate method of teaching children about art, artists, authors, book illustration, and the variety in creative processes. The fold-out pages make it more interactive for the child and the portraits help them identify each artist/author. Although my three year old is a bit young for this book, she enjoyed folding out the pages and looking at the colorful illustrations. This is one I would love to have in my own personal library as a wonderful reference. I am anxious to see if this becomes a series since there are so many wonderful picture book artists out there. The proceeds of the book go to the Eric Carle Museum of Picture Book Art.